I just wanted to take a minute to thank you for posting this. Sometimes, I feel like I am in over my head when speaking to others in love with the literary field! It’s nice to remember that we’re all people who are working toward the same passion, no matter where we’re starting. 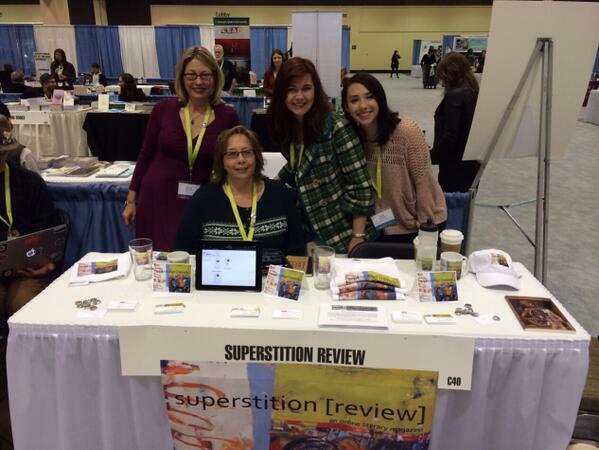 What a great experience the AWP conference must have been! I would have loved to have been there. Erin, I love your story about sitting next to Benjamin Saenz on the airplane! I would have been nervous too, and I applaud you for introducing yourself! I just really relate to this entire post– I know how difficult to actually call yourself a writer, especially when you’re surrounded by such accomplished people. AWP sounds like such a great experience, and I’m glad you got to go! Wow Erin, what a well-written piece! I loved hearing about your opportunity to meet and hear all your favorite authors, and I was given the shivers when you told the story at the end of the reading gone wrong. As individual writers, it’s sometimes difficult to feel the community surrounding us, but when we go to publish, it’s always nice to know that we are surrounded completely and that no matter what we publish, how bad it is or how good it is, we will always be supported and encouraged by those who know what we can do. Thank you for this! I am also a bag of nerves getting ready for this year’s AWP–feeling like I’m trying to sneak into a club that I don’t belong in. This sets my fears (a bit) to rest. P.S. Incredible that you got to chat with Saenz. I could sing praises forever and ever about Dante and Aristotle Discover the Secrets of the Universe.